I love how you understand the full art of street crossing! I never feel like I’m fully familiar with a city until I feel comfortable enough to jaywalk in it! So many differences…waht a great book that would make…crossing the street around the world! 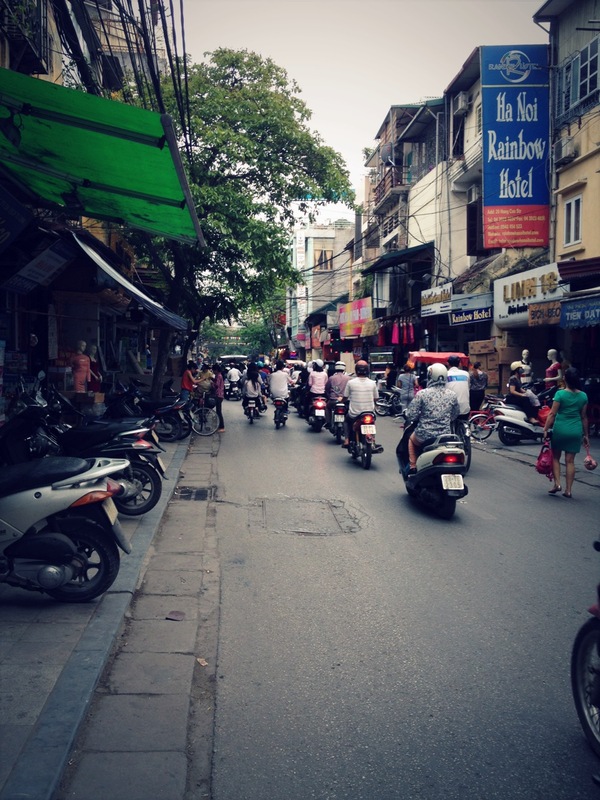 I had to laugh as I read your description of the traffic in Hanoi. The endless stream of scooters does make crossing traffic a challenge. I understand your fear every time you headed across the road, but you had the right idea, look ahead and let them miss you. This sounds like Jakarta!! We usually put out what we call “the magic hand” which is an up-turned “stop in the name of love” hand signal that seems to let oncoming cars, trucks, motorbikes, etc. know to swerve around us. I usually look for a human shield–a fearless native–and walk across the street with them. I must get to Hanoi!! This sounds amazing! This sounds like India…but at least there is a methodology, other than luck, which will get you across to safety. Whew!